EyeCGas CO2 is a handheld OGI camera for CO2 gas leak detection. With this camera you can safely and remotely detect and locate very small concentrations of carbon dioxide emissions whether used as a tracer gas for finding leaks, for monitoring various industrial processes, or for enhanced oil recovery (EOR) operations. It is also the only OGI camera that is certified for ATEX zone 2 and UL class I Div II, hazardous environments. The EyeCGas CO2 allows for the inspection of vast areas in a plant. It contains an automated and simple user interface which shows the infrared image on a large color LCD. The EyeCGas CO2, helps you detect and repair gas leaks inside the facility limits without the need of a hot work permit, allowing video and audio recording while maintaining safety. Enhanced Oil Recovery (EOR) operations, power generation plants, and detection of CO2 as a byproduct in industrial processes. EyeCGas CO2 is an innovative product for gas leak detection that allows for safe, quick, and cost effective detection of very small carbon dioxide emissions. 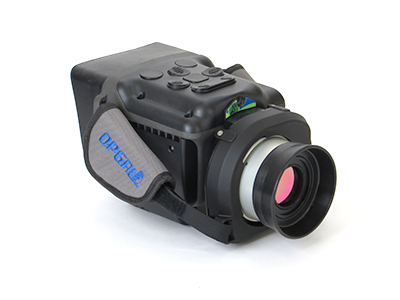 It is the only OGI handheld camera for use in ATEX zone 2, UL class I Div II, and CSA hazardous environments. For more information or a quote, contact us today. Safety Certifications -UL1604, Electrical Equipment for Use in Class I and II, Division 2, and Class III (Classified) Locations. -CSA C22.2 No. 213-M1987, Non Incendive Electrical Equipment for Use in Class I, Division 2 Hazardous Locations. Class III Hazardous (Classified) Locations. Video and Audio recording Digital recorder build-in with connection to PC via USB 2.